Once a week you will receive our e-mail up to date information. We do not disclose to anyone e-mail addresses. Kazakhstan was the last of the Soviet republics to declare its independence from the USSR. The years following the gaining of its independence were marked by reforms which served to aid the re-employment of Soviet-style economic management and the reinforcement of the political model of power it was characterised by. The constitution gave Nazarbayev mandate to be the president for four years. He has since been granted life-long presidency. In 1991, Nursultan Nazarbayev was elected President of the Republic of Kazakhstan. He had previously held the position of Secretary General of the Communist Party of Kazakhstan, since 1984. Since his appointment, Nazarbayev has been methodically extending the scope and longevity of his rule. From a Soviet republic, Kazakhstan has become a presidential dictatorship. Nazarbayev extended his term of office through a series of elections and a referendum, none of which met international standards. Nazarbayev was constitutionally empowered to preside over the republic for four years – he now holds the title of ‘lifelong President’. Through the office of the President, Nazarbayev effectively controls the executive, parliamentary and judicial authorities of the country. The President has the power to legislate by decree, and also has the exclusive right to appoint and dismiss judges and ministers. The President's power is exercised through an extensive apparatus of subordinated administration and government, which, to a large extent, is staffed by individuals having a background in the old communist regime. The Constitution of Kazakhstan, adopted in 1995, declares the supreme authority of the President in all state matters. The Constitution refers to the President as the “Head of the State”, “Official Authority”, “Symbol and Guarantee of the Unity of People and State Power” and “Symbol and Guarantee of Human Rights and Freedoms”. Unlike other states, which compartmentalise the executive, legislative and judicial powers, the Constitution of Kazakhstan concentrates power in the office of the President. The President appoints senior government officials, including the Prime Minister, the cabinet, the Prosecutor General, the Chairman of the NSC [an institution that has effectually succeeded the Soviet KGB], the President of the Supreme Court, judges of a lower standing and the President in addition to two members of the Central Electoral Commission [CEC], which oversees elections. The lower house of the parliament is required to confirm the President's installation of Prime Minister, and the Senate approves the presidential election of the Prosecutor General, Chairman of the NSC, the judges of the Supreme Court and the President of the National Bank. The Parliament has never opposed the President's appointments. 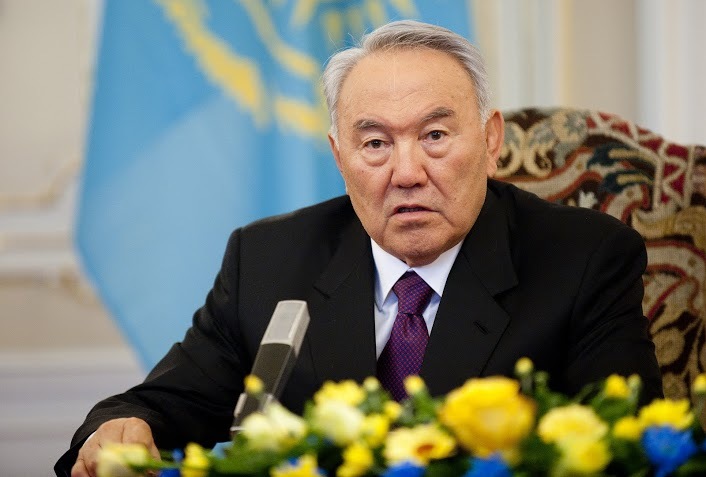 Modification or amendment of the Constitution also requires the approval of Nazarbayev. Nursultan Nazarbayev was elected President after obtaining 91.5% of the vote in the first round of the December 1991 election. Before Kazakhstan gained its independence, Nazarbayev was the First Secretary of the Kazakh Communist Party, and was appointed Prime Minister in 1989. The law allows Nazarbayev – and not only Nazarbayev – to run for president numerous times . Nazarbayev’s initial term of office was set to coincide with the end of 1995. However, it was extended by referendum, in which Nazarbayev received 95% of the vote – and it was thusly extended until mid-2000. The securing of the victory was effectively guaranteed by the wording of the question posed in the referendum. The voters replied with ‘yes’ or ‘no’ to a single, multi-part question: “Do you vote in favour of the right to private property, maintaining the sovereignty of Kazakhstan, the Kazakh state language and the extension of Nazarbayev's term of office?”. Nazarbayev was also re-elected in the January 1999 and December 2005 elections. The Organisation for Security and Cooperation in Europe (OSCE) has expressed its doubts over the transparency of the election of 1999, and commented thusly on the election of 2005. “[The election] did not meet a number of recommendations of the OSCE and other international standards for democratic elections” – in the words of their statement. In 2007, Parliament adopted amendments to the Constitution, abolishing the maximum limit of two terms of presidential office. The amendment provided that Nazarbayev (and he only) be allowed (to repeatedly apply for re-election. In Kazakhstan, the cult of the individual is worshiped. In June, 2010, Parliament gave Nazarbayev the title of the ‘Leader of the Nation’. The title is not only symbolic – it also grants the President criminal and civil immunity for the entire duration of his term of office. The image of the President, which is captioned ‘Leader of the Nation’ is under special protection – criticism of it is treated as a serious offence. with major shocks, he is preparing for this task very carefully. If you observe (from the outside) the activities of Kazakhstan on the international stage, aimed at creating an image of an exemplary democratic state, which, despite the difficult environment, complex ethnic and religious mosaic and lack of traditions, is characterised by internal stability and impressive growth, you may ask the question: Why, in the last two years, has there been a wave of repressions on an unprecedented scale? The transferral of power consists of three phases. The first, changes in the political system, which gave Nazarbayev the prestigious title of the ‘Leader and Father of the Nation’ and lifetime personal and property immunity (also extending to his family members). Electoral rules were also changed for the event of resignation of the President before the expiration of his term of office. In such circumstances, the acting head of the state, the President of the Senate, would be allowed to rule without the need for an early election until the end of the term ( three years). The second phase is the pacification of all independent environments, which would in turn, ensure the ‘inner peace’ of the country – that is lack of criticism from the media and the opposition. The third phase involves personnel reshuffles, including the highest levels of authority. In autumn, the Prime Minister and the head of the Presidential Administration were dismissed. In January, the Chief of Staff of the Armed Forces and the Chief of the Internal Forces were replaced. Nazarbayev is replacing loyal servants who are yet capable of creating own fractions, and therefore potentially dangerous subordinates, with new people, predominantly connected with himself: members of his family and clan members. According to speculation, the successor to Nazarbayev (after taking the position of the Head of the Senate) shall be his nephew – Akhmetzhan Yessimov, the current governor of Almaty.